Preheat the oven to 350 degrees F. Lightly coat a 7- by 11-inch baking dish (see Note) with cooking spray. Heat the olive oil and butter in a large nonstick skillet set over medium heat. Add the onion, celery, parsley, sage, thyme and nutmeg. Cook, stirring frequently, until the celery is soft, about 5 minutes. Place the bread cubes in a large bowl and stir in the onion mixture. Season with salt and pepper. Pour in the chicken broth and toss to combine. Stir in the dried cherries and pecans. Transfer the stuffing to the prepared baking dish. 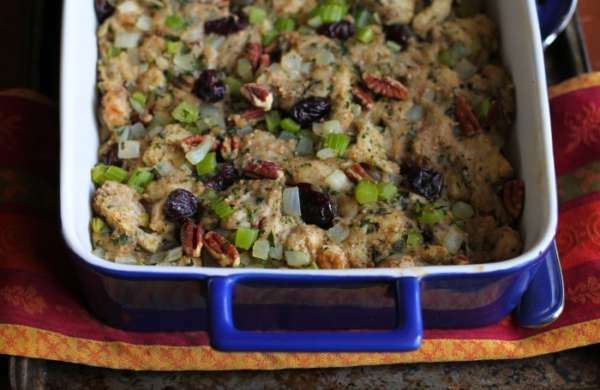 Bake until the stuffing is heated through and a light crust forms on top, 20 to 25 minutes.